The biggest issue Jennifer has had with having to watch the kids all by herself culminated this evening with a stunt pulled by Abby. While taking a shower she decided it would be cool to stand on top of the soap dish. Although still a little girl, soap dishes were probably not stress tested with seven-year-olds standing on top of them. 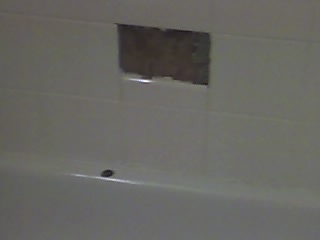 The result: the soap dish came crashing down and put a nice hole in the tub. Basically the kids are either messing up the house faster than she can clean it, or repair it in this case. Jennifer was so furious that she had to walk away to keep her cool. She ended up grounding Abby for the rest of the week: no television and she couldn’t go next door and play with her friend. She tried to explain to Abby the cost of repairing things and how no one will want to buy the house if it’s damaged. Abby went to her room and came back out with the money she had been saving up from the Tooth Fairy and Easter, around $50, and offered it to Jennifer to repair the tub. Jennifer told her to keep her money. Maybe there’s a glimmer of hope for Abby after all. This entry was posted in Abby, Family, Jennifer by Jason. Bookmark the permalink.